Reno, NV-August 22, 2002- Montreux Golf and Country Club today begins the 4th annual Reno-Tahoe Open. Hikanoo was contracted to design and maintain the leaderboard during the four day event last year, and once again continues to maintain its tradition with the tournament this year. While this is the fourth consecutive year the PGA Tour has stopped at Montreux, the tournament once again conflicts with the World Golf Championships: NEC Invitational, being played at the Sahalee Country Club in Sammamish, WA. However, next year Montreux Golf and Country Club hopes to solidify its own tour date in an attempt to capture golfing's elite, including Tiger Woods, Ernie Els and Phil Mickelson. Montreux Golf and Country Club is a private, gated golf course community in Reno, Nevada and plays host to the Reno-Tahoe Open, a PGA tour event August 20-26. 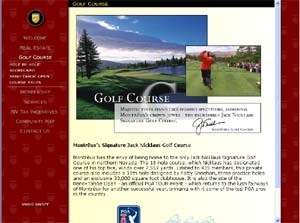 Jack Nicklaus, the designer of the course, states: "The scenery and the woodlands are magnificent. Of all of the courses I have designed, Montreux will certainly be one of my top four or five."